If your home is located in Chapel Hill, North Carolina and was built within the past sixty years it is very likely that the walls and ceilings were installed using a material called drywall. Like most things in your home sooner or later the drywall will need attention or repair of one kind or another. When this happens the work should be left to a professional wall and ceiling contractor. A skilled contractor that specializes in drywall can fix nail holes, cracks, loose joint tape or metal corner bead, stains, torn paper and restore surfaces to their original state. 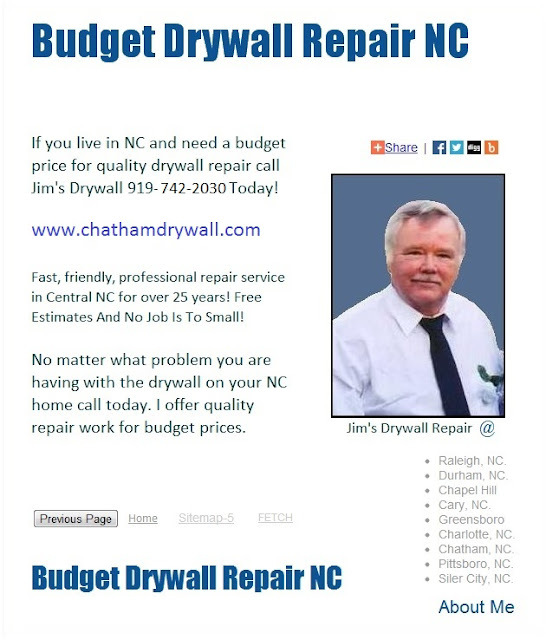 Call 919-742-2030 today for fast, friendly, professional drywall, wall, ceiling and texture repair service in Chapel Hill, Pittsboro, Siler City, Chatham County and all surrounding areas. Estimates are always free and no job is to small. Drywall Repair Should Be Left To A Pro Contractor Whenever Possible. If your home is located in North Carolina and was built within the past sixty years it is very likely that the walls and ceilings were installed using a material called drywall.